The AC Milan camps are held in some of Italian most famous and exclusive locations of the Italian Alps – as Cortina d’Ampezzo [Alps – Dolomites], the Asiago Mountain Plateau – and of the Italian Adriatic Coast as the seasides of Jesolo Lido [Venice] and Lignano Sabbiadoro [Udine]. The AC Milan Academy Camp – JUNIOR formula is the typical AC Milan Camp formula which comprises the stay in the hotel with the other participants. The basic rate for a week session at the AC Milan Academy Junior Camp is 860 Euros (875 for goalkeepers). For all the Junior-formula campers the full board accommodation is included in the cost of the camp. During the meals mineral water will be always available; free snacks will be available twice a day, mid-morning and mid-afternoon, as the mineral water at the playing field too. The AC Milan Academy Camp – DAY formula is the AC Milan Camp formula without overnight stay designed for participants who can come to the camp on a daily basis. The campers do not stay in the hotel, they arrive each morning to go to the soccer field with the entire group and return home after showering and changing after the second workout in the afternoon or evening. 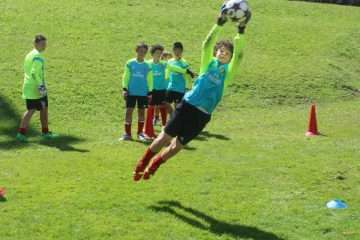 The basic rate for a week session at the AC Milan Academy Day Camp is 660 Euros (675 for goalkeepers). For all the Day-formula campers the lunch is included in the cost of the camp. During the meals, mineral water will be always available; free snacks will be available twice a day, mid-morning and mid-afternoon, and the mineral water at the playing field too. The only exception is about the Jesolo site. In fact two afternoon trainings will be postponed at the evening (in general Tuesday and Thursday, 7.30 pm – 9.30 pm) and Sporteventi will offer a soft dinner at the Day-formula campers. (*) The cost of the two-week-camp doesn’t include the week-end stay (from Saturday 2 pm to Sunday 2 pm). The week-end stay costs 100 euros (additional cost); this extra-fee is not obligatory. The AC Milan kit will be assigned to the camper only once. At the moment of enrolment, a down payment of € 300,00 must be paid. The remainder must be paid no later than 15 days before the date of the selected session. All pertinent indications are reported in the section “enrolment” or directly on the enrolment form. At the moment of enrolment, anyone wishing to particulate in two consecutive sessions must pay the down payment plus an additional € 100,00 for dinner and accommodation on Saturday, breakfast and lunch on Sunday and oversight during the period. There is a fee of € 90,00 for the Airport procedure regarding an “Unaccompanied Minor”. The cost of sending the Letter of Invitation to obtain the Visa is € 15,00. The enrollment fee for the “JUNIOR-FORMULA” CAMPERS includes full-boar accommodation in a hotel (3-star or higher), from Sunday afternoon (lunch excluded) to Saturday morning (lunch included). The enrollment fee for the “DAY-FORMULA” CAMPERS includes all the lunches from Monday to Saturday. When they check in (on Sunday afternoon), all campers receive an “AC Milan Academy” sports kit to be used during the camp. For greater details on the kit, see the pertinent section of the web site. We do specify here, however, that soccer shoes are not included in the kit. Conditions for the Individual Insurance covering Accidents: the insurance will reimburse up to the amount corresponding to the insured amount for the expenses as prescribed by the general practitioner, as effectively paid and demonstrated with original copies (invoices and/or receipts) for: practitioner visits, exams and lab analysis, hospital fees, medicines and physiotherapy / re-educational treatments. The reimbursement will take place once the clinical recovery is completed and following the filing of the justifiable documents. The payment of the insurance claim will be paid after the deduction of 10% of the expenses paid, min 200 euro (a 200 euro deductible). N.B.1: Sporteventi will carry on the insurance procedure, then the parents and them alone will be always in contact directly with the insurance company Allianz SPA. N.B.2: The Individual Insurance for accidents is quite effective ONLY for the Italian participants who are also covered by the Italian National Health System. Therefore we STRONGLY suggest to the participants NOT ITALIANS to provide for an insurance covering risks of accidents, illnesses and hospitalization during their staying in Italy. 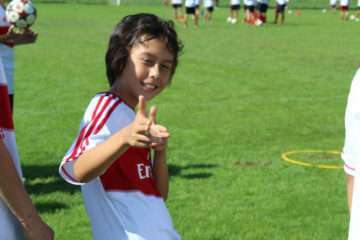 In every camp, one or two boys will be able to take part in the AC Milan Junior Camp Day, the friendly tournament among the best entrants in all AC Milan Academy Camps worldwide, which will take place, presumably in March – April, at the Vismara – AC Milan Sport Center. Vismara is the sport centre where all AC Milan youth teams side train (the first team and the Primavera (U19) team train at Milanello instead). There should be about 200 boys, who will play each other in friendly games all day long. Afterwards, they will be taken to the San Siro stadium for a AC Milan home game. N.B. The date for the MJC DAY will be announced as soon as known but, anyway, NOT before December. Sporteventi has always decided to guarantee its subscribers with optional services that are deemed important for a successful Camp. A little more that all parents have greatly appreciated, especially mums. The AC Milan Supervisors are champions of the AC Milan Club history or member of the AC Milan Youth Sector. To be able to live near some pieces of the AC Milan history, such as Pierino Prati, Filippo Galli, Stefano Eranio and Walter De Vechi who can tell their own stories during relaxation moments, who can seat and eat with the youngsters means to make camp participants to live an unforgettable experience and probably they will be also envied by their own parents. 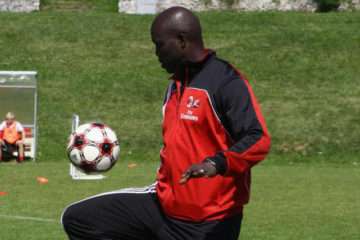 Manager, coaches and assistants of the camp live in the hotel with the boys and supervise the rooms also at night. Coaches and assistants are all qualified and specialized personnel, selected by Sporteventi to provide the best service to the families. For the youngest camp participants who might be missing their mothers, it is important to have a female assistant. The classic female approach can be important in dealing with feelings and emotions during the week. The assistant is in any case a member of the staff severely selected. We guarantee transport services with a private bus from the hotel to the stadium and back. Bottled Mineral water is always available in the playing field and it is distributed by our female assistant. Food is very important and that is why the delicious “Bibanesi” – sesame breadsticks of the highest quality – are always present on the table during the meals. Twice a day, at mid morning and mid afternoon, the boys of the camp will have DORIA snacks. All the sports garment are numbered to be easily recognizable by their respective owners and are therefore always washed to ensure top hygiene conditions. Please remember that underwear is not part of the kit and will not be washed. We recommend bringing at least one change of underwear per day. If you wish to stay for two consecutive camp sessions you will be requested to pay a deposit and further € 100,00 for dinner and the night between Saturday and Sunday, Sunday breakfast and lunch plus the supervision during the week end. On express request and not included with the subscription fee, the transport services to and from the “Marco Polo di Venezia” airport, to and from the Treviso Airport and to and from the the Verona Airport will be effected by bus services which have arrangements with Sporteventi. All children-teenagers under the age of 15 years, if they come to camp alone with aircraft, in order to book the taxi-transfer service organized by Sporteventi, will have also to book the procedure “unaccompanied minor” for the return flight. The cost of transportation from the site of the AC Milan Camp to the departure-airport in this case undergoes a further burden of 90 Euros because the taxi-driver will be responsible for carrying out the procedure “unaccompanied minor,” accompanying the child / teenager during check-in and up boarding “in the hands” of the hostess (about 3 hours). N.B. For the roundtrip transfer costs you have just to double the costs above! As far as the waiting time at the airport, there is a half an hour exemption, besides which the waiting time is charged at Euro 4,00 every 15 minutes.